In any civilized society archaeological sites are cherished as national treasures. Archaeology acts as conduit that allows the humans to look into the past beyond the written records. Pakistan is also rich in archeological treasures but it doesn’t give equal attention to all of them. MoenjoDaro, Harappa and Shahlamar gardens are given more importance than Mehrgarh in Balochistan. Mehrgarh is the oldest archaeological site in modern day Pakistan. It’s the second oldest Indus valley site after Bhirrana, located Haryana India, according to Archaeological Survey of India report of 2014. It’s situated in Kachi district of Balochistan, at a distance of 30 kilometer from Sibi city. Spreading on an area of over 250 hectares, Mehrgarh is home to the oldest farming settlement of Indus valley civilization. According to archaeologists, Mehrgarh was founded in year 7000 BC and abandoned in year 2500 BC. Mehrgarh predates MoenjoDaro and Harappa civilianization and, in fact, Mehrgarh was abandoned due to advent of urbanized phase of MoenjoDaro. Residents of Mehrgarh practiced proto-dentistry 9,000 years ago. Based on the examination of a tooth discovered form a grave in Mehrgarh, flint heads were used to drill teeth to cure toothache. This is just a glimpse of how modern Mehrgarh was in context of Neolithic period of history. Credit of discovery of Mehrgarh goes to a French archeologist couple; Jean-François Jarrige and Catherine Jarrige. In 1974, Mehrgarh was discovered by Jean-François Jarrige and Catherine Jarrige while they were working on an archeological mission in Kachi plains. Excavation work on Mehrgarh was carried out in two phases, from 1974 to 1986 and again from 1997 to 2000. Unfortunately, Mehrgarh has never got the required level of attention that MoenjoDaro has got from the federal government. As a result, archeological site of Mehrgarh has been damaged due to erosion and a tribal feud. Moreover, in October last year Italian government recovered antiques that were stolen from Mehrgarh. As of this moment Balochistan government has not received them back due to bureaucratic red tape and lack of interest of the officials. That’s another indicator which suggests that Mehrgarh and its assets are not being protected in an appropriate way. Hafeez Jamali, an Anthropologist and Director of Balochistan Archives, doesn’t agree with the assertion that provincial government is not doing enough for Mehrgarh. He states that archeological work in entire province has ceased due to deteriorating law and order situation. He also added that Archaeology department was devolved to provinces after the 18th amendment and therefore it’s in transition from federal control to provincial control. According to Mr. Jamali, devolution of archaeology department is also contributing to delay in conservation work on Mehrgarh. Furthermore, Mehrgarh is not receiving the due attention because it has not acquired the status of World Heritage Site. UNESCO designates archeological sites of physical and cultural significance as world heritage sites. There are 6 such sites in Pakistan at the moment. World heritage sites receive funds for preservation from World Heritage fund. Most importantly, Word heritage sites are protected from hostility and destruction during act of war under Geneva Convention and Hague Convention for the Protection of Cultural Property in the Event of Armed Conflict. UNESCO also maintains tentative list of sites that can be designated as World heritages sites in future. Mehrgarh is part of tentative list since 2004 but so far it has not been designated as a World Heritage Site. 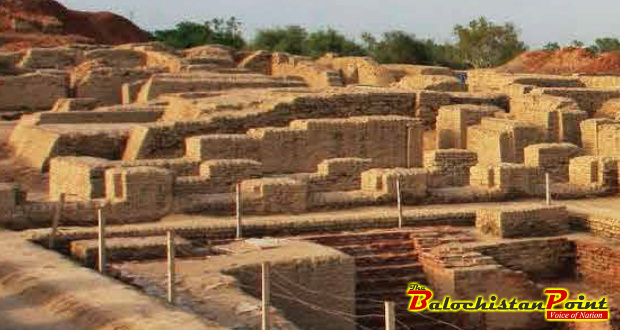 Archaeological site of Mehrgarh is remainder of the golden age of Indus valley civilization. This is a national asset and should be protected by both federal and provincial governments. If government of Balochistan didn’t start preservation of Mehrgarh site in war footings then this can be lost altogether in near future. UNESCO also needs to understand that designating Mehrgarh as a World heritage site can literally save it from gradual destruction. Balochistan government would be compelled to look after Mehrgarh in an appropriate way once it has been designated as a world heritage site. Lastly, members of civil society, social organizations and academics need to play their part in putting pressure on government to protect Mehrgarh. Loss of Mehrgarh would not be a loss of few old structures but it would be a gigantic misfortune for generations to come.